This article was originally published in the Malay Mail Online HERE. More than just a meal for those feeling under the weather, a Teochew porridge feast can be a comforting affair especially after a series of guilt-ridden feasts (i.e. food excursions and post-travel blues anyone?). I usually avoid eating hot, soupy food unless ­I feel under the weather. Call me impatient, weird or just plain picky, but eating porridge cooked with softened (almost to a pulp) carrots or noodles cooked in a light, anchovy-flavoured broth will never evoke spectacular memories for me. Instead, these “comfort foods” only serve to remind me of the painful ordeal of recovering from chicken pox when I was still a toddler. That could be the reason why I have stayed away from porridge or even anything remotely soupy (even curry noodles; which explains why I prefer dry curry noodles instead) most of my life. But how times have changed. I guess one’s tastebuds change with age; and gradually I learned to be receptive towards foods that I could never be bothered to eat, let alone crave. Brinjals, bitter gourds, offal and yes… rice porridge. 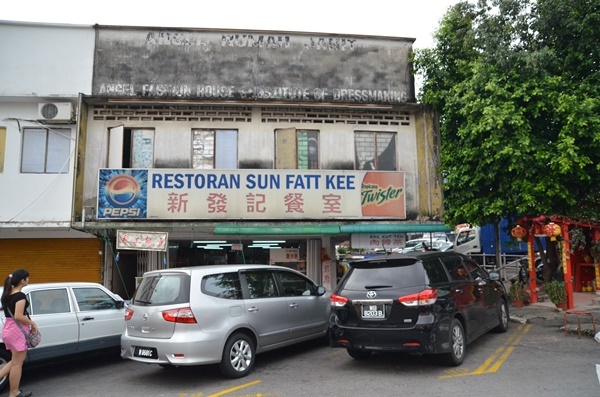 Although Teochew porridge stalls can never match the number of economy/mixed rice stalls all over Malaysia, if you search hard enough you will find a handful in most neighbourhoods in the Klang Valley, especially the older residential or commercial areas. 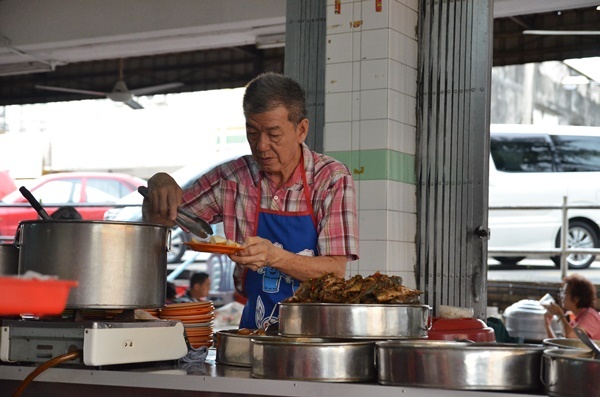 The affable proprietor of the Teochew porridge stall has a smile and greeting for every customer. My favourite stall thus far has been this nameless one located within Sun Fatt Kee Restaurant in Seapark, Petaling Jaya. The name might sound unfamiliar to you, but most locals know this shop for the Bumbung Nasi Lemak (or more fondly referred to as the Seapark Nasi Lemak and their crispy fried chicken) that operates only in the evenings. By day, the Teochew porridge stall shares the crowd with a pan mee stall, a pork noodles soup stall and an equally noteworthy curry noodles stall as well. The elderly duo running the porridge stall put out a delectable Teochew spread that is usually consistent in terms of selection and taste, yet reasonably-priced for the masses. 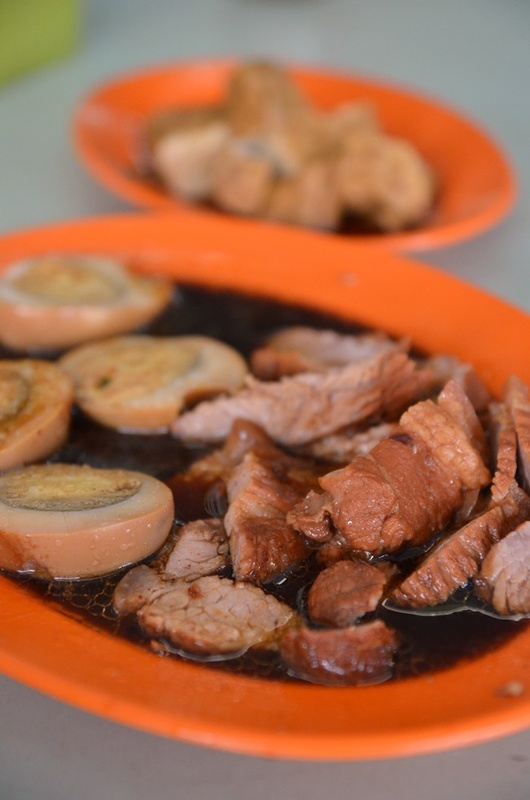 You will need to arrive after 9am to treat yourself to a splendid and complete feast of Teochew delights, but avoid the lunch crowd if possible to mitigate the risk of having your favourite dish run out. And trust me; the lunch crowd can be a little bit intimidating during the peak hours given the density of residences and offices around the vicinity. The next question would be; with at least more than a dozen dishes on offer, which ones to choose? Now this part is easier. 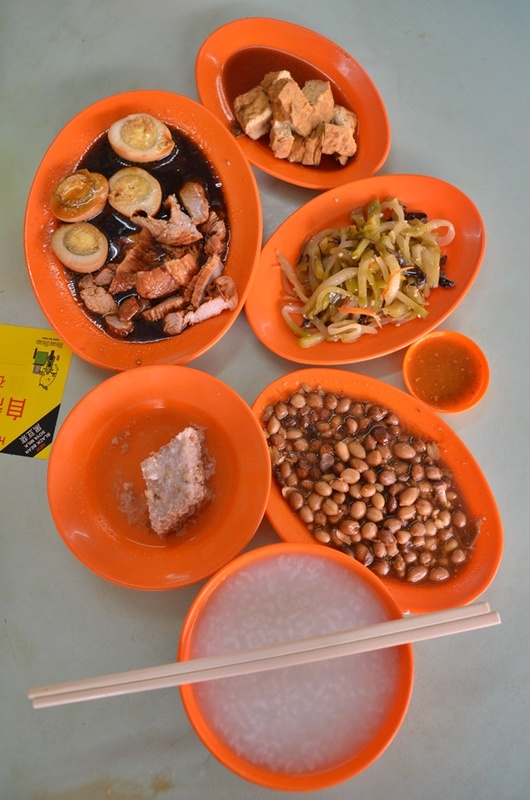 Unlike typical Cantonese style chu char places, Teochew porridge stalls provide the option of choosing smaller portions (i.e. one salted egg, one piece of fish, one chunk of braised pork, etc.) so that you can taste a variety of their offerings despite dining alone. The braised pork with hard-boiled eggs and braised beancurd are two very authentic and flavoursome dishes that will lend your bowl of rice porridge sufficient oomph. I typically scoop a few spoonfuls of the gravy from the braised dishes and mix them with my porridge for a slightly savoury finish. If that’s not enough for you, then feel free to ask (although the friendly proprietors will always offer you) for some of their own-made vinegar chilli sauce blended with ginger and coriander. The tangy chilli sauce may appear diluted and generic but will complement the meats perfectly. If you see their stir fried chili clams (la la) or stuffed ikan kembung with chilli paste available for the day, then do NOT give them a miss. Both dishes utilise very fresh supplies from the nearby wet market and the chilli paste really brings out the flavour in each of the dishes. Bringing back memories of grandma’s trademark stir fried spicy pickled mustard greens with sliced pork, this dish of char choy with shredded wood ear fungus is simple yet delicious. However you may need to come at the right time though, as I sometimes come here early for breakfast (before 9am) and these options are not ready yet. The thought of walloping protein-laden dishes one after another may sound daunting but rest assured that they do offer quite an ample number of vegetable dishes daily. 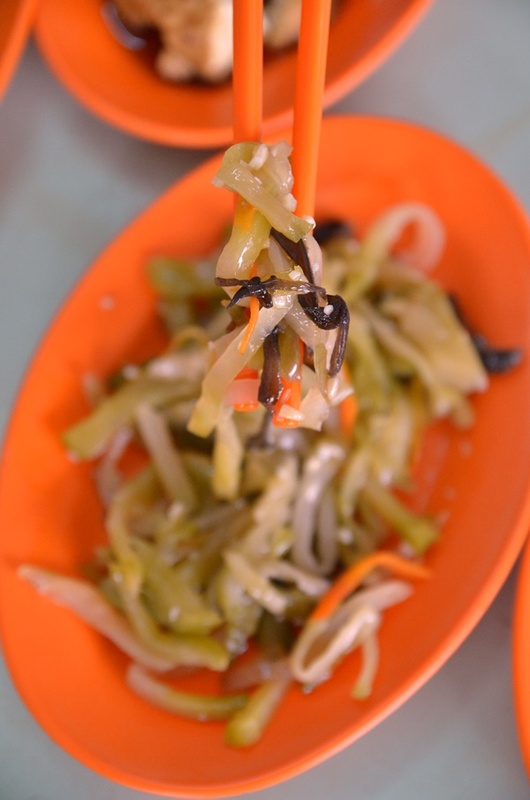 For this particular morning session, I had to choose between stewed cabbage, stir fried bean sprouts, their signature cauldron of boiled ham choy (salted vegetables) or my pick of crunchy char choy (spicy pickled mustard greens) lightly stir-fried with chopped wood ear fungus. 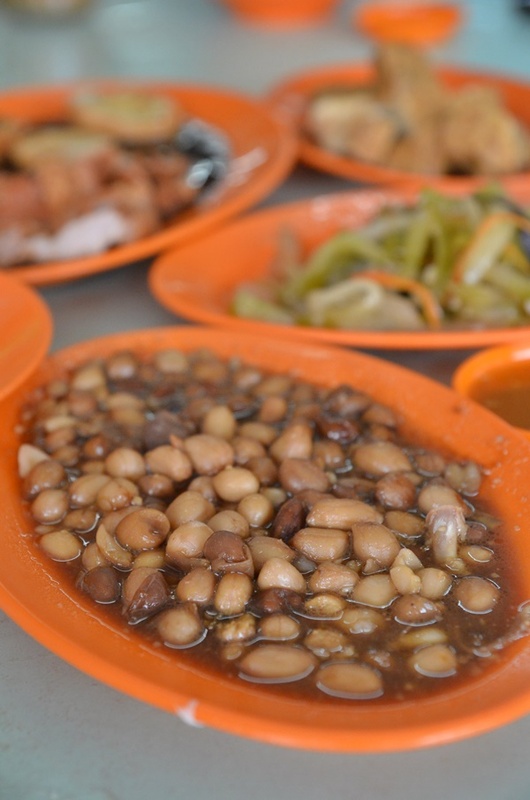 Lastly, choose to complete your Teochew porridge feast with a salted egg, braised hard-boiled egg, or even a plate of braised soft peanuts or spicy, crunchy anchovies with peanuts. A meal for two with 4-5 dishes usually comes to about RM15 or so, but depends on the dishes and the portions that you select. And before you wonder what about the quality of their rice porridge? The porridge is excellent and fitting the Teochew style; boiled to a neither too hard, lumpy nor overly-smooth consistency but you can still taste the texture of each softened grain of rice. Alternatively, you can also choose to have steamed white rice to go along with the dishes. Closed on one or two Thursdays a month, depending on the coffee shop owner.